Jacksonville hosts Miami United on Channel 4 at 7 p.m.
JACKSONVILLE, Fla. - When the Jacksonville Armada made the decision to play in the National Premier Soccer League this year, there was an expectation that the former North American Soccer League club would have a chance to dominate. In many ways, they have, but it doesn’t make Wednesday’s playoff match, the first in club history, any less special. "We usually have Monday off, but because it's a playoff game, we were in. Everyone was ready to take in information and ready to go," said head coach Mark Lowry. Last year, the Armada narrowly missed out on the NASL playoffs, and it has been a long and winding road for the club and its supporters over the past four years. Two leagues, two owners, four head coaches. That’s why Lowry said Wednesday’s match is more than just a competition, it is also a cause for celebration. "For the fans who have had four years of a bit of a rollercoaster, to have a little bit of success means a lot," Lowry said. "It doesn't really matter if its NPSL (or) NASL right now. The name of the league is irrelevant right now, it's more of an occasion. The fans deserve this. I hope they turn up and we put on a show for them and continue this run." The Armada will face a familiar opponent, Miami United. The two clubs have met three times this year, and Jacksonville is still searching for their first win against Miami United in 2018. Twice in league play, the clubs drew, including a 0-0 final in Jacksonville on June 23. 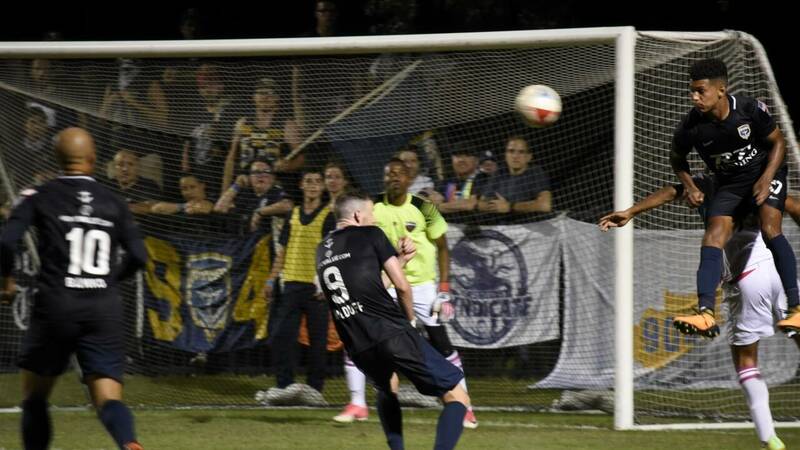 The match that really sticks in the craw of the Armada came in the U.S. Open Cup when Jacksonville fell to United in the second round at home. That match was played at JU. Wednesday’s match will be played at UNF Hodges Stadium, where the Armada have not lost a game this year. "It feels like a Cup Final week," said Armada forward and captain Ciaran Kilduff. "As a player, you always look to play on the biggest stage and the biggest occasions. We're in the NPSL and we want to win it. It kind of feels like last year where there is something on the line that really matters." For a few of the Armada players, this match has added meeting. Michael Melvin went to Nease High School, and he said that he was excited about the possibility of one day playing for his hometown team. Now he starts at left back and is looking forward to Wednesday’s match. "As soon as I saw that, it was one of my goals. I knew that if I wanted to play professional, this would be a good place to start. It's been really fun this summer," said former Nease High School star Michael Melvin. In the hour before the match kicks off, there will be more Armada developments. Tim President Nathan Walter will be a part of a town hall meeting for residence in the Patton Park area who will have the chance to voice their opinions about the Armada's plan to build out a section of the park to become a small stadium where the club can play until a permanent new home can be constructed. Jacksonville city councilman Aaron Bowman will lead the discussion.